This unit plugs into the dock connector of your ipod and, in essence, your ipod becomes a multi disc changer. That means you can control the ipod from your stereo or even your steering wheel (if you have the controls and is supported). Monster Cable's utilizes SoundGate technology that enables the connection of an Apple iPod directly to a factory-installed Jaguar car stereo through the existing Cd changer port. Utilizing the iPod's dock connector, the direct connection to the car stereo results in ultra-high sound quality and performance. Additionally, iCruze lets you navigate playlists and tracks directly through your car stereo Cd changer controls (and steering wheel controls too, if so equipped), as well as control the volume. Each Cd changer disc selection corresponds to your favorite playlists with as many tracks as desired in each playlist. So a six disc Cd changer offers access to six playlists. configuring playlists for optimal use with iCruze is easy and offers access to all tracks on the iPod. Pressing the button that activates the Cd changer controls on your car stereo (often labeled Cd ) will activate the iPod. Your car stereo instantly begins communicating with your iPod and starts playing the first track of the first playlist on your iPod. iCruze allows you to jump from playlist to playlist like you would change Cds in a Cd changer. For example, Disc 1 represents Playlist 1 on your iPod. Pressing the seek, skip, fast forward/reverse, or up/down buttons tracks through the songs in the selected playlist. Your stereo will display the track number, which corresponds to the same track in the playlist on your iPod. Note: Some car stereos will only display track numbers up to 99. Tracks 100 and higher in a playlist may not be displayed correctly. To navigate larger playlists, your stereo's fast forward/reverse functions will jump up or down track listings in increments of 10 songs. Go from the top to the bottom of a playlist and back again in a flash. By pressing random or shuffle, iCruze will randomly play songs from the currently selected playlist. 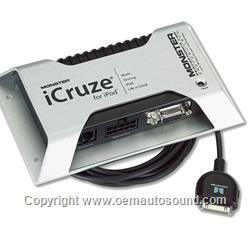 iCruze dash-mount Lcd display to further enhance the iCruze for iPod driving experience. The display is a multi-line, 20-character blue backlit Lcd text display that shows the song name and artist information, making iPod playlist navigation even easier. The display connects to iCruze via an RJ-11 (phone jack) connection and easily mounts onto the dash.